Earlier this year I read Charles Mann’s 1491: New Revelations of the Americas Before Columbus and was rewarded with another reminder of how thin my understanding of our hemisphere’s history is and how much new knowledge is being added by multiple disciplines. Here was a whole new world to be explored. 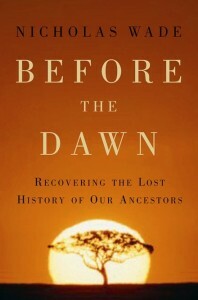 Nicholas Wade’s book is another must read for those of us educated before the impact of the decoding of DNA had begun. He attempts to summarize what we have learned based on contemporary genetics combining it with the vast base of earlier research from paleoanthropology, archaeology, linguistics, and other fields. Wade opens the book with a great little story about how genetics has determined a probably date for when human beings first began wearing clothing. Based on the fact that body lice are descended from head lice and show a special adaptation specifically providing body lice with the means to hang on to the fibers of our clothing, genetics is able to date our adoption of clothing to be about 72,000 years ago “give or take a few thousand years”. While discussing the evidence for the paths of human migration away from the African homeland, Wade mentions that the biggest region for the paucity of physical data is that because we were in glacial period, seal level was some 300 feet lower than today. Thus, since early humans would have followed the coast line to be close to a ready source of food, their early habitations are now well below water. I won’t attempt to summarize the book. Rather I urge you to retrieve it from your local library. ← A Fog of War or a Fog of Ethics?